If you have diabetes, two types of insulin—basal insulin and bolus insulin—help you maintain an optimal blood sugar level, replicating the body's normal functioning as closely as possible. Basal insulin, also referred to as background insulin, regulates your glucose levels in between meals, and bolus insulin is extra insulin needed to manage your glucose levels after a meal. The body needs insulin for glucose management and metabolism. When you eat, your food is digested and converted into glucose (sugar) so it can be used for energy. Every cell in the body needs energy from glucose to function properly. Some of the glucose from food is used immediately by the cells, and some is stored in the liver as glycogen, a reserve molecule that is used later on. Insulin is needed to store excess glucose in the liver and to transfer it from the blood to the cells when it is needed. The pancreas secretes more insulin right after a meal (bolus insulin) to manage the rapid increase of blood glucose that comes from food. This process quickly returns blood glucose to normal levels after eating. Between the glucose that is consumed through food and the glucose that is gradually released from the liver, the body gets a constant supply. In addition to the insulin release after a meal, the pancreas also constantly makes and releases a small amount of insulin into the blood to help manage the regular release of stored glucose in between meals. Basal insulin, the background insulin that is normally supplied by the pancreas, is released 24 hours a day, whether or not a person eats. If you have type 1 diabetes, the beta cells of the pancreas that normally produce the insulin have largely shut down. Both your basal insulin and your bolus insulin must be obtained through injections or from an insulin pump in order to process all of the glucose taken in through food or released by the liver. Type 2 diabetes, which is characterized by a decreased cellular response to insulin, rather than a decrease in insulin itself, may also require insulin treatment, although this treatment is not as common as it is with type 1 diabetes. Bolus insulin injections replace the extra insulin the pancreas would naturally make in response to glucose taken in through food. The amount of bolus insulin needed depends on the size of the meal. Basal insulin injections replace the background insulin that your body would normally make between meals to maintain constant blood glucose levels. There are several characteristics that differ between the types of insulin. The onset, duration, and peak are among the most important distinctions. The onset of insulin refers to the amount of time between your injection and when the insulin starts to lower your blood sugar. The duration of insulin refers to how long the insulin will continue to work after it starts to take effect. The peak refers to the point where the insulin is working at its maximum capacity or is the strongest. The onset, duration, and peak are longer for basal insulin than for bolus insulin. And, while replacement insulin is designed to replace either bolus or basal insulin, the medication itself is defined based on how long it acts, ranging from rapid-acting to long-acting. Rapid and short-acting insulins are used for bolus replacement, while intermediate and long-acting forms are used as basal replacement. Rapid-acting insulin is designed to begin working quickly, usually with an onset of about 15 minutes after injection. Rapid-acting insulin is often used immediately before a meal to offset the rise in glucose that occurs from eating. This insulin peaks about one to two hours after injection and lasts up to five hours. Like rapid-acting insulin, short-acting insulin is meant to be taken before eating. It has an onset of about 30 minutes, typically peaks in two to four hours, and can last up to eight hours. Short-acting insulins include Humulin and Novolin (regular). There is only one intermediate-acting insulin on the market and it is called neutral protamine Hagedorn (NPH). In contrast to the clear fluid of the rapid and short-acting insulins, NPH has a cloudy consistency. This cloudiness results from insulin crystals in the solution. NPH has an onset of about one to two hours, peaks in about eight hours with a duration of up to 16 hours, but this duration can vary from person to person. It is not uncommon for people taking NPH to also take a dose of regular or rapid-acting insulin to cover meals, which is also referred to as bolus insulin. Long-acting insulin has an onset of about an hour. Because it is designed to stay in the system longer than the other types of insulin, it does not have a “peak” action point. Once it takes effect, the intended purpose of long-acting insulin is to maintain a consistency that helps control blood glucose levels when you are not eating and especially during sleep. This long-term action is also referred to as basal insulin. Long-acting insulin typically has a duration of up to 24 hours and is usually supplemented with a rapid- or short-acting insulin to cover for rising glucose at meals. They begin working about two hours after injection and are released slowly, peaking at four to eight hours after injection, with a duration of up to 24 hours to provide the background insulin that is needed around the clock. Degludec is considered an ultra long-acting basal insulin, with a duration of up to 48 hours. 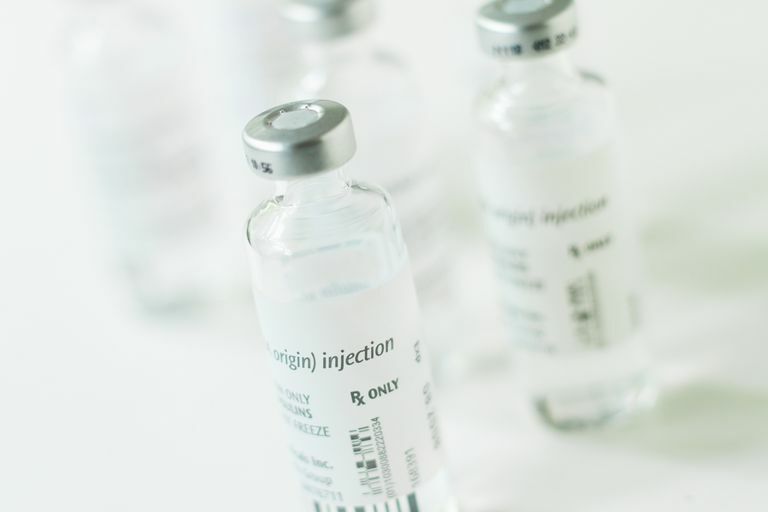 There are several pre-mixed insulins available that combine varying amounts of intermediate-acting insulin with rapid-action or short-acting insulin. These mixtures serve as a convenient way to obtain the benefits of both types of insulin while only injecting once. These pre-mixed insulins have an onset of between 15 minutes and one hour, depending on the mix. The peak time varies and each can last up to 24 hours. It's important to know how to properly give yourself an insulin injection so that you can prevent skin damage and improve blood sugar control. If you are unsure about how to use an injection or rotate injection sites, for example, speak with your doctor. Know too, though, that your recommended insulin course could require a basal bolus insulin regimen—when you need to take both types, not just one. For a person with type 1 diabetes, this means that multiple injections of bolus insulin to cover meals and snacks, along with basal insulin to keep the glucose in check, are needed each day. While this can maintain your blood glucose at a constant level, allowing some flexibility in your meals, it can be exhausting and may require several injections per day. An insulin pump is an alternative to injecting some kinds of insulin. A pump typically provides a constant low dose of fast-acting insulin that acts as the basal background insulin. Before meals, you would take a larger dose of fast-acting insulin to cover your anticipated caloric intake. This satisfies both the basal and bolus needs using the same fast-acting insulin. Both basal and bolus insulin can cause hypoglycemia, which is excessively low blood sugar. This condition can cause lightheadedness, fatigue, fainting, seizures, or even death. It is more likely to occur rapidly with bolus insulin, which is fast acting, in contrast to basal insulin, which can lower your blood sugar slowly, allowing you time to eat or drink something containing glucose to compensate for it. On the other hand, if you use basal insulin and then do not eat as scheduled, you can also become hypoglycemic, although the results may not be as dramatic. Whether you are planning on injecting your insulin with a syringe or using an insulin pump, discuss these options and your preferences with your doctor or dietician. The type of insulin most likely to control your blood sugar depends on a number of factors, including your typical blood sugar, lifestyle, and how busy you are. Your dose and schedule will be calculated with a healthcare professional who will make sure that you know how to measure the insulin, calculate the amount of insulin you need, and increase or decrease your dose if you eat more or less than anticipated during a meal or snack. He or she will also review dietary guidelines with you so that you can maintain a healthy blood sugar level, good nutrition, and a healthy weight. Lovre D, Fonseca V. Benefits of timely basal insulin control in patients with type 2 diabetes. J Diabetes Complications. 2015 Mar;29(2):295-301. doi: 10.1016/j.jdiacomp.2014.11.018. Epub 2014 Dec 5.